If you are, like myself, a big fan of post-apocalyptic, survival type of games, then you will find Sheltered an amazing title: one that’s insanely difficult, but also incredibly fun to play and extremely addictive. It is a bit like This War of Mine, but with a different approach and more options in my opinion. And we’re here to see how to get better at it by checking out some Sheltered tips, tricks and strategies to survive for as long as possible. 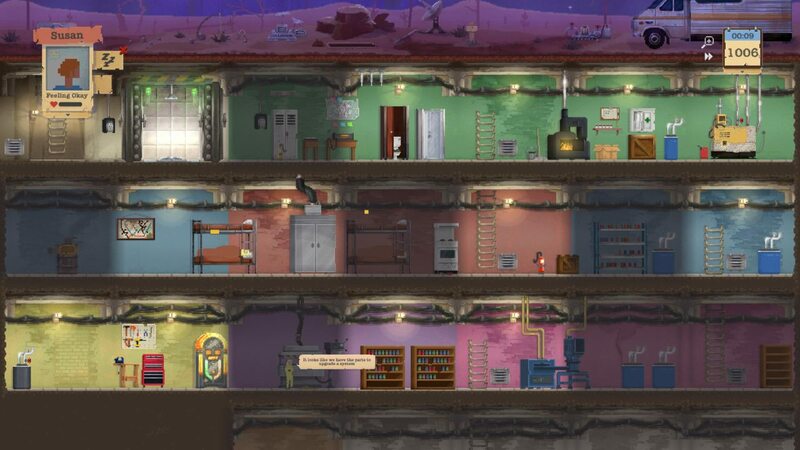 The game has been in early access for a while and its current form is completely different from the early stages of the game and this guide refers to the new version – so if you haven’t played for a long time or you’re just starting to play now, this is the up-to-date guide for Sheltered. 1. Choosing the right stats and traits for your family is extremely important. Remember that these are the only choices you can make when it comes to the survivors – anybody else will already have pre-set numbers and even though you can increase some through training, starting on the right foot is extremely useful and can really make a difference. My recommendation would be to start the game with specialized survivors. You need at least one that’s good at fighting, so go for one of the parents and make them Courageous and either Troubled, Violent or Bully. I would go as far as selecting both parents as Courageous, with different pre-sets for each one. The kids will stay inside, so one of them is definitely a Hands-On / Brain Box or Well Educated combination (extremely useful when it comes to crafting), while the other one should be either a Proactive with Street Smart or Alert or a Resourceful with Bully/Street Smart combination, the later being better for mid and late game stages. Finally, there’s the pet and I personally consider them an extra challenge. I would either go for the Cat (easy to maintain, even though pretty much useless) or the Horse (very useful when it comes to gathering loot, but requires Stables AND 3 food per day). I would choose the Horse most of the times, but if you’re just starting out, it’s best to go for the Cat. 2. Your first week or 10 days are extremely important in the game and they should lay the foundation of an easy or extremely difficult game. During this time, you should always focus on getting the basic stuff done. This means that you must set up some Water Butts (water is extremely important so you need to make sure you have a steady supply), a shower and a bucket toilet (IMPORTANT: keep them as far away as possible from the food storage, otherwise you will get a lot of food poisoning), mop, beds and some storage. If you have the horse, you need to get the Stables done and if you have the resources, you should build another room. Also, make sure that you start putting the kids to work (while the parents explore) and have them repair the water and air filter as they are also extremely important. Finally, you should upgrade the Workbench at least once. 3. Exploring and looting is also extremely important from the beginning to the later stages of the game. Early on you should focus on the closest locations (especially since the possible loot refreshes every few days, so you’ll always get some more) and later on focusing on the more important parts, choosing the most useful places to loot, like Police Stations, Banks, Shacks and so on. When deciding what items to take with you, always go for their importance/value first. Food is extremely important and have in mind that you need a lot more if you have the horse. Then this is the order in which you should take the items, after food: tools (but if you have more than one, they’re useless – unless you want to use them to trade), fuel, gas masks and all the materials that you need. Based on my own playing experience, the least useful things to bring are Medicine, Metal, Wood and Nails and even Anti-Rads if you have enough masks. If not, Anti-Rads become very important! It is always good to know what you need, how much of it you need and what the value of the items is. You should always take the items that you need and consider them more important than anything, but also have trade in mind and bring the stuff that you can get some nice trades for. Always think both short term and long term when looting. 4. Try to avoid fights as often as possible. This doesn’t mean that you should flee every time you meet a survivor, but you should never engage them into battle. I found out that the best approach, if you have the option, is to trade: always trade something in order to improve your charisma and get better trades later on in the game. Try some of the ridiculous trades, like giving 1 Fuel for 2 Fuel: sometimes it will work! But even if you trade one for one, you should still do it for increasing your stats. If it gets to a fight, then you’re hopefully having the right people to do it. If you selected the recommended character builds I mentioned above, then you already have an advantage. But other things matter: the equipment and armor of your enemy, as well as how many people you’re facing. If you are not sure you stand a chance, it’s always better to run away than start a battle you can’t win! 5. You should be extremely picky with the survivors you bring in. You don’t really know what you’re getting until it’s too late and you should never hurry. If you’re low on food or water or if you simply know that you won’t be able to easily sustain a new soul, don’t bring them in! It’s better to be patient than risk it on a crappy survivor that will do more harm than good. Recruiting survivors in Sheltered is better done (or at least so was my experience) by radioing for survivors instead of getting the ones that you meet outside, as the latter usually have poorer stats. 6. Don’t forget about getting the meat to keep your stomach full: place traps, as many as possible and also send your survivors to fight bears in the woods, as unsafe as that would sound. Focus on getting food and leveling up your characters, because you need to keep them well fed and growing their stats in order to remain useful throughout the game. 7. Upgrade everything! After the first few weeks in the game, you will probably have a solid grip on the game’s mechanics and, most important, the stuff that you have to do. Always keep your survivors working/doing something useful (while making sure that all their stats are safe, of course). Looting is extremely important, but so is getting all the items that you need in your shelter, so always upgrade and build new stuff to make sure that you have everything. Build the planters as soon as you get the chance and, combined with the traps and your looting runs, food will no longer be a problem for you, even if you have the Horse. Sheltered is a game that requires a few playthroughs for you to get better, no matter how much you get to read about it before or after trying it once or twice. It does help to know the mechanics and how things are working, so I really hope that you found our Sheltered game tips and tricks useful. If you have some additional tips to share with fellow players, stuff that will make their game better, don’t hesitate to share them with us in the comment section below.